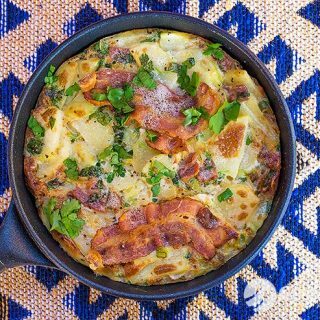 I could have called this dish tortilla with bacon instead of crispy bacon frittata. They are both the same dish, only made in different countries. 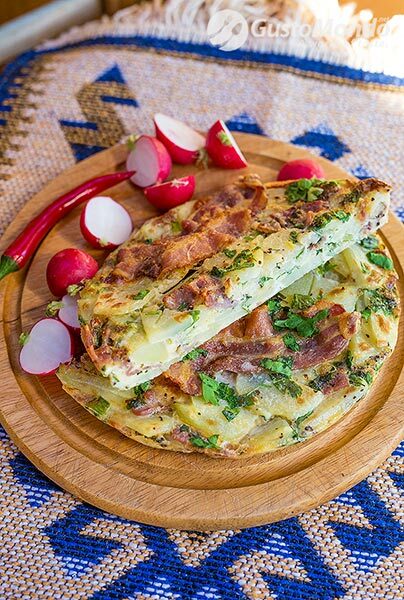 That’s why tortilla gets a mention here, so we don’t upset anyone with this simple recipe. Eaten hot, warm or cold, all through the day, there’s really not much to it but it has a lot going for it. You could “personalise” this with a lot of other ingredients. Bacon, ham, or cooked chicken. Leek, green or red peppers, courgette or even aubergine. Parsley, dill, celery leaves. Anything goes as long as the two main ingredients, potatoes and eggs are present. The short clip below is quite good in showing you how to make it, and the ingredient list follows. It is rather important and it needs mentioning, that the potatoes really need to be parboiled for this. Raw potato won’t cook in time and you’ll end up with hard potato slices, not nice at all to eat. Five minutes will be quite enough for them to soften whilst still keeping their shape and some texture. I also pre-cooked the bacon, in a dry pan. Again, the texture of the crispy bacon works fine here, if you use raw bacon you’ll get bits that are soft and chewy. I left the two bacon rashers whole because they look better in the final product. 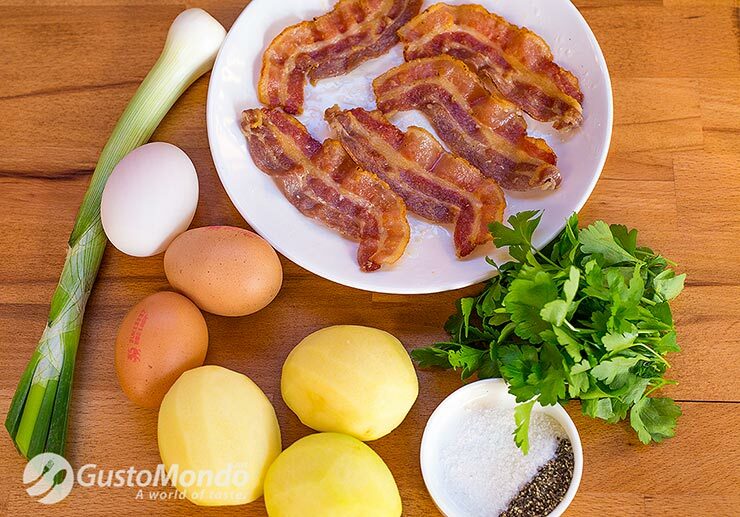 Remove the excess bacon fat from the pan before sweating the onions and cook the egg and potato mixture at the end in a dry pan, as long as the pan is non-stick. Enjoy this short recipe and don’t hesitate to make it your own version with all the ingredients that you like best. Pan-fried hake fillets with capers and lemon sauce. Beer sauce prawns, or shrimp. « Aubergine and pork stew. A simple tasty recipe, video recipe included. It seems a tasty dish with a light onion flavour…Also good for this season. I like it!